With twice the holding power of it’s sister machines, the SO328 is great for the busy cafe or restaurant. 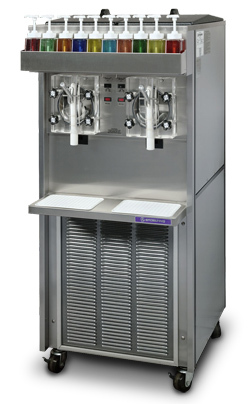 Able to hold two flavors (or one, if you do a large amount of business), the SO328 produces a thick slush well suited for stacking or post mixing. The system easily adapts to bag-in-the-box or remote pre-mix autofill systems, and comes equipped with ten flavor dispensers. The cup holders are optional.